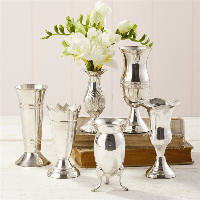 Two's Company Silver Queen Anne's Vases elegantly brightens up any table top. This European-inspired, silver-plated brass set features 6, Queen Ann style silhouettes, made from solid brass, with silver plating and a lacquered finish, perfectly complementing any décor. Product Dimensions: From 1 1/2" W x 2" D x 3 3/4" H to 2 1/2 W x 3 3/4 D x 5"